For a DBMS that provides support for a declarative query language like SQL, the query optimizer is a crucial piece of software. The declarative nature of a query allows it to be translated into many equivalent evaluation plans. The process of choosing a suitable plan from all alternatives is known as query optimization. The basis of this choice are a cost model and statistics over the data. Essential for the costs of a plan is the execution order of join operations in its operator tree, since the runtime of plans with different join orders can vary by several orders of magnitude. An exhaustive search for an optimal solution over all possible operator trees is computationally infeasible. To decrease complexity, the search space must be restricted. Therefore, a well-accepted heuristic is applied: All possible bushy join trees are considered, while cross products are excluded from the search. There are two efficient approaches to identify the best plan: bottom-up and top-down join enumeration. But only the top-down approach allows for branch-and-bound pruning, which can improve compile time by several orders of magnitude, while still preserving optimality. 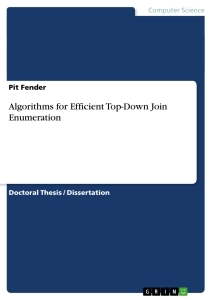 Hence, this thesis focuses on the top-down join enumeration. In the first part, we present two efficient graph-partitioning algorithms suitable for top-down join enumeration. However, as we will see, there are two severe limitations: The proposed algorithms can handle only (1) simple (binary) join predicates and (2) inner joins. Therefore, the second part adopts one of the proposed partitioning strategies to overcome those limitations. Furthermore, we propose a more generic partitioning framework that enables every graph-partitioning algorithm to handle join predicates involving more than two relations, and outer joins as well as other non-inner joins. As we will see, our framework is more efficient than the adopted graph-partitioning algorithm. The third part of this thesis discusses the two branch-and-bound pruning strategies that can be found in the literature. We present seven advancements to the combined strategy that improve pruning (1) in terms of effectiveness, (2) in terms of robustness and (3), most importantly, avoid the worst-case behavior otherwise observed. Different experiments evaluate the performance improvements of our proposed methods. We use the TPC-H, TPC-DS and SQLite test suite benchmarks to evaluate our joined contributions. Umsetzung von Efficient Consumer Response am Beispiel des Fastfood-Unternehmens McDonald´s Deutschland Inc.